Yeah, It’s another space post. Yes, It’s another space post. Again. I promise I can write about other things — but things in space are just so cool, it’s hard not to! 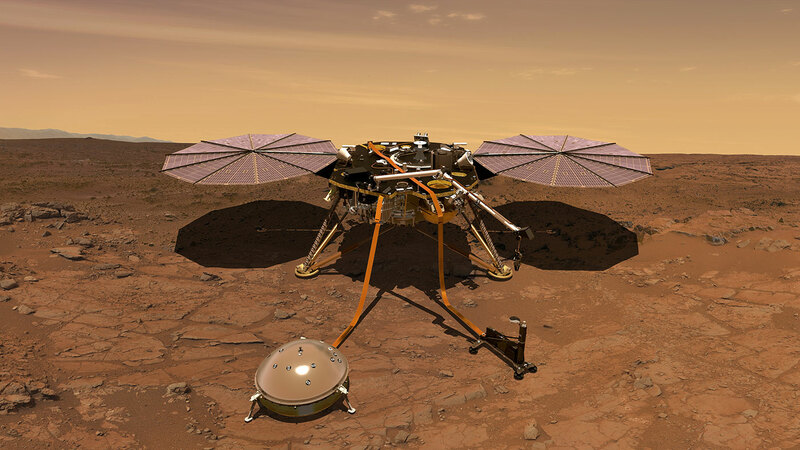 This week — on Monday, November 26th — NASA‘s InSight Lander (standing for Interior Exploration using Seismic Investigations, Geodesy and Heat Transport) will complete its nearly 500 million kilometre journey to the red planet and touch down on the Martian surface. Scientists, legitimately, are pretty worried about this landing. Missions to Mars only have about a 40% success rate, so people are a little nervous. Once the lander enters the very top of the Martian atmosphere, it will only take around 7 minutes to reach the planet’s surface. For obvious reasons, they refer to this as the “seven minutes of terror.” During this time the rocket will decelerate from about 19,800 km/h to 0 km/h. It will hopefully deploy both its parachutes and retro-rockets to slow itself down and softly land. All of this will be computer controlled, though. Light takes at minimum 4 minutes to reach Mars from Earth, not including the time for a signal to return. As a result, the landing will be controlled entirely by computer executing a pre-programmed sequence. If something goes wrong, there is nothing that engineers at NASA can do to help. This mission to Mars presents a really unique opportunity (see what I did there?) for NASA and space agencies around the globe to do some really interesting research into what Mars is made of. This will be the first ever geologic mission to Mars, and there’s a lot of new stuff to be learned. InSight will be able to study the deep interior of Mars with a brand-new suite of new instruments. InSight’s includes experiments like the Seismic Experiment for Interior Structure and the Rotation and Interior Structure Experiment. These experiments which provide new seismic measurements of Mars, and provide precise measurements of Mars’ rotation and wobble. On a more personal note, this mission is pretty cool to me for another reason. As part of their public relations outreach program, NASA asked people to submit their names to be included on the probe. I did, and they etched mine, along with 2.4 million others, onto tiny silicon wafers attached to the lander. If all goes well on Monday, my name will rest on surface of Mars. If the landing is unsuccessful, my name will be obliterated on the surface of mars at thousands of kilometers per hour. Cool either way! If you want to watch the landing live, more information can be found at NASA’s website here.